By pure chance I was having a bit of a twitter morning and noticed that Film 4 were showing a stop animation. Since I am off work today and any excuse to watch something new and drink tea, I figured I would check it out. 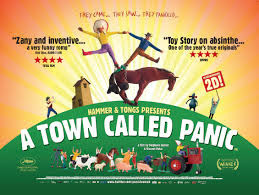 A Town Called Panic (Panique Au Village) is a delightfully hilarious French/Belgian stop animation. A tale of a cowboy, Indian and horse who are housemates in a small town. After forgetting horses birthday cowboy and Indian's attempt to muster up a birthday present hugely backfire. Despite the help of their screaming neighbour Steven and his wife Janine the events that follow will have you crying with laughter. The weird and the wonderful unfold introducing insane and diverse characters that will bring a smile to even the most miserable face. Pigs that go to bed with blankets, donkeys that brush their teeth and a world where horses drive cars. If you don't fear subtitles and like getting lost in silly humour then you need to see this film. Not to be put off by the length as it is not the average animation and even managed to keep my terrible attention span satisfied. Packed full of action and unusual twists that can be enjoyed by both adults and children. Before this was a film it was a 20 part series which I will definitely be hunting down. However you may be familiar with the work from the recent Cravendale adverts. If you enjoyed these small comedy gems then you will not be disappointed. If not check it out here for a sample of what you are in for. I have always been a sucker for stop animation and am dying to make one myself. Help keep this art form alive and support work like this. If any one else has any other animation recommendations comment away. Good call Film 4 for getting me smiling this morning.